Surface analysis techniques such as quantitative depth profiling (QDP), usually require sophisticated and expensive instruments and tend to have very high spatial resolution. There is a widely held belief in the industry that all surface analysis techniques are difficult and require expert operators. 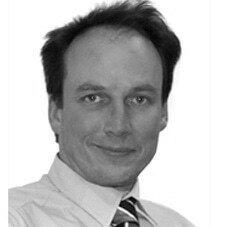 However, the latest developments in glow discharge optical emission spectroscopy (GD-OES), an alternative instrumental technique, dismisses many of these beliefs by providing a simple solution to quality control (QC) in surface coatings and treatments. Incorporating these new developments and the latest instrumental improvements, the Leco GDS-850A GD-OES, extends the benefits of this technique further, providing faster operation and accurate and reliable quantitative measurements of non-conductive layers. This is particularly useful as it becomes more commonplace for metal sheets such as steel sheets to be coated with all sorts of different materials for different purposes. For example, zinc-coated steel used in car bodies is often covered with a very thin anti-fingerprint coating. This keeps the surface clean and gives a higher quality paint finish. These coatings are often organic materials and so are electrical insulators. Other materials are sometimes mixed with the organic coating to enable the sheet to be welded. If the coating is too thick or of the wrong composition, the panels cannot be welded properly or there could be problems with adherence of the paint. Figure 1 shows the analysis of yellow paint on a zinc-coated steel sheet - the data shown is only from the surface to the paint/zinc interface. The chromium peak shows where chrome has been applied to the coating to improve the adherence of the paint and the elemental composition of the paint shows its complex composition - the paint is about 30µm thick. This analysis is for QC purposes and is particularly helpful in identifying problems in both the automotive and aerospace industries. QDP provides an elemental composition of the paint and so can help identify the causes of poor paint adherence or colour reproducibility. Figure 1. Analysis of yellow paint on a zinc-coated steel sheet. 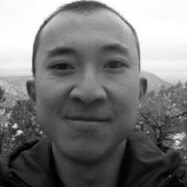 This can be helpful in identifying surface quality problems in both automotive and aerospace industries. • The sputter rates of many common reference have been accurately measured and are stored in libraries on the computer. These sputter rates are applicable to all other Leco instruments under all operating conditions. QDP using GD-OES has been used to solve many real industrial problems, not just on non-conducting coatings such as painted steel sheet. 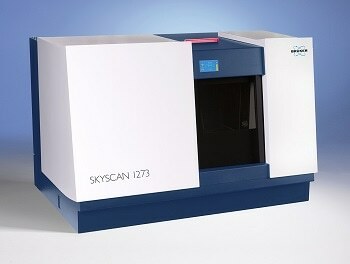 Other typical applications of this technique include analysis of nitrocarburised steel and zinc-nickel coated steel. 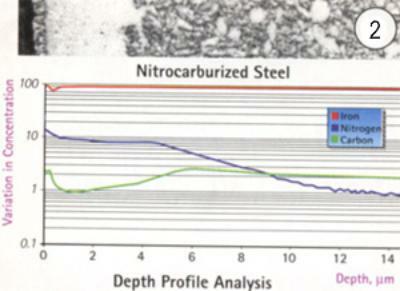 The object of nitrocarburising is to vary the hardness/elasticity of the treated materials with depth. It is generally used to make the surface harder so for example, on a gear, the surface is hard-wearing but the interior is (more) flexible to reduce fractures caused by stress when rotating or changing speed. 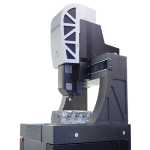 The classic way to test for quality is to perform a case-depth hardness profile. A section is cut through a test piece and this is then ground and polished for viewing under a microscope. Microindentations are then made at various distances from the surface and the size of each indentation is measured to calculate the hardness. A plot of hardness against depth is produced from these measurements. 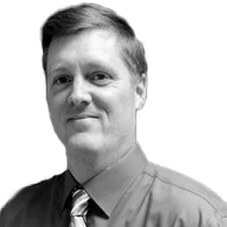 This process is very time-consuming and only a certain amount of automation is possible. 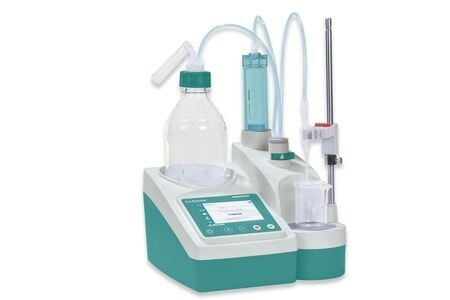 GD-OES can provide similar information within a couple of minutes without any sample preparation. Figure 2 shows a photomicrograph of the outermost 15µm of a section through nitrocarburised steel. Below this, on the same scale, is the QDP analysis of this material (these results are what people doing case-depth profiles will be used to seeing). The variation of concentration with depth for nitrogen and carbon can be related directly to the variations observed in the structure under the microscope. Figure 2. 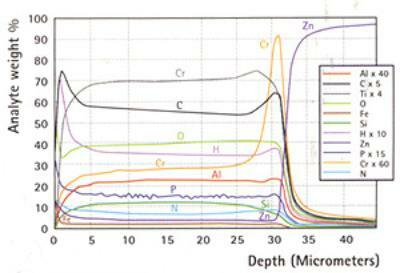 Photomicrograph and QDP analysis of a nitrocarburised steel. On zinc-nickel coated steel GD-OES can easily identify a good and bad coating. 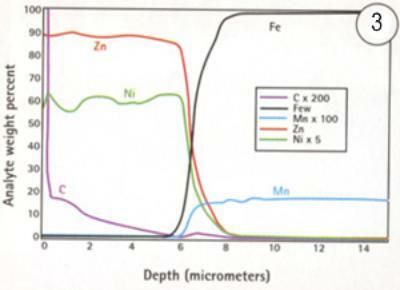 Figure 3 shows the QDP analysis of a good Zn-Ni coating on a steel sheet to a depth of 12µm. 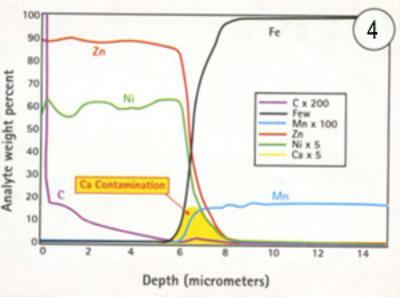 Figure 4 shows the same analysis, but illustrates a bad coating, revealing the presence of calcium at the interface between the coating and the steel. Such results enable users to then identify the possible origins of the calcium, which was present in the cleaning process but had not been removed in rinsing. The consequences of such contamination are poor adhesion of the coating and a risk of delamination. Figure 3. QDP analysis of a goof Zn-Ni coating on a steel sheet. Figure 4. QDP analysis showing a bad Zn-Ni coating, revealing the presence of calcium. • The improvements in plasma start-up enable the outermost layers, which are often the most important, to be quantified. As GD-OES can also perform routine bulk analysis on raw materials, it provides a single analytical technique for a wide variety of surface treatment at coating applications. Source: Materials World, Vol. 9, No. 4 pp. 9-10, April 2001.